• Explore Whistler on our 4 new bicycles: Ride our Giant-brand bikes on the paved cycling paths through the woods or to the nearby lakes (Available May-October, for flat trail use only). • Walk everywhere from our fantastic location in Whistler Village (we're located at Main Street & Northlands Blvd). We're centrally located, and it's quiet at night when you want to sleep (no pub/club noise that you'd hear on the village stroll). • Easy access to this ground-level townhouse with no stairs, so you can bring ski gear, strollers, etc inside easily. • Use the beach/park blanket for outings to the nearby lakes (a 30 minute walk or 10 min. bicycle ride), easily accessible from the paved 'Valley Trail' or the wooded trail. • Walk to ski lifts (8 min. walk) or take the free shuttle that stops outside our townhouse (1-2 min ride). • We are a fully legal vacation rental with special municipal zoning for VRBO - no surprises here! We can accommodate up to 8 people, but this total would include children as part of the capacity because it would be a tight fit for 8 adults (6 adults max please). Reservations with more than 6 people have a small fee per night to reflect additional cleaning/laundry costs (you can see this by entering the total number of people on your reservation). I've lived in BC for the last 20 years, after moving from Ontario, and fell in love with the west coast. 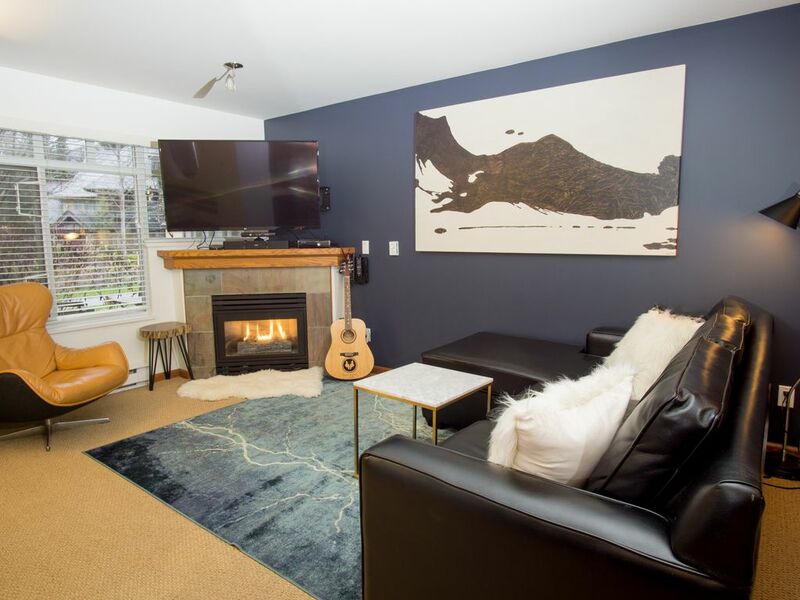 We loved it here so much we bought this townhouse in Whistler and we turned it into our luxury Whistler getaway and we're so happy to be able to share it with you :) My husband and I split our time between Whistler and Vancouver. We love ice skating, skiing, riding our bikes in Whistler to the local lakes. My husband and I are both musicians so we love playing music with other people (hence the guitar that we keep in Whistler). I'm an amateur bass player and my husband Chris is a professional drummer and percussionist. We chose this property because of it's great location. It's walking distance to everything (the Village is literally across the street) so you won't need a car while you're here. I'm a light sleeper so I love that it's quiet at night but everything is still SO close. We also chose this townhouse because load-in is easy (no stairs, ground-level) and you can store your ski gear inside the suite. This townhouse complex has a lagoon courtyard at our front door, and you'll be able to see the top of the ski hill from the living room window. It's a family-friendly townhouse complex in the Village, so you get the best of both worlds. The location is great - you can walk everywhere. If you don't want to walk the 8 mins to the ski lifts, there is a free shuttle that goes by right outside the complex and will take you directly there (1-2 min ride) In addition, the Valley Trail (a paved walking and biking trail through the woods) is right outside our door so you can easily go exploring! Fireplace is natural gas and is operated by a thermostat beside it - very easy to operate. We have one reserved spot for you, plus lots of overflow parking spots in the parkade - all are free. Live-edge hardwood table with seating for 8. On our 55" TV we have cable (including sports channels) and Netflix. Board games and cards for various ages from toddlers to adults. We have a small selection of toys for the young ones. We have an xbox 360, kinect, games, and more. The Lagoon Courtyard in the townhouse complex has lots of green space, benches, and more. Four bicycles available from May-October. Guests must sign a waiver in order to use them. We have front patio with a BBQ and small patio set with a view of the mountains. We also have a rear patio with the hot tub. We're an 8-minute walk from the ski lifts (400 metres or so), or you can take the free shuttle that picks you out from outside the townhouse complex. There is a slightly-raised threshold at the main entrance - otherwise our unit is all on one level and is easy for strollers and folks with mobility issues. We have a private hot tub on the back patio facing the forest for your use exclusively. It's serviced before and after every booking for you. Great condo at a great price for a family get away. Condo is quiet, comfortable, and well stocked. Across the street from the market. We walked through the village every day to the mountain base/gondola (easy 10 mins). What a great place to stay. We really enjoyed our week in Whistler, especially our lovely accommodation. 4 adult skiers in our party, plenty of space to store all our gear, extremely comfortable beds and lovely decor throughout. Super TV with lots of channels, Xbox for my grownup son😀� and extremely well equipped kitchen with everything we needed. The hot tub was a real bonus for tired legs at the end of the day. We would love to stay here again. The townhouse/cabin was the perfect size and the perfect location. The jacuzzi was an added touch that we thoroughly enjoyed after skiing all day. We parked the car and didn’t need it the whole week. Whistler is a must visit! Karen was a wonderful host. One of the most thoughtful and comprehensive vacation rentals ever! Karen's property is amazing. They have a slew of amenities that you wouldn't expect from a typical vacation rental. Examples include a great Bose soundbar with Bluetooth so we can listen to 'tunes while hanging out near the fireplace. The private hot tub overlooks a forested pathway. The bunk beds were pretty huge and we comfortably crammed 3 people in that room. The pull-out couch was big enough for two more people. There was a nice acoustic guitar and we got to play + sing after skiing! The location for skiing is ideal. The bus stop is right across the street. I've done more walking when staying closer to the village. There was ample overflow parking in the garage. Great in-unit ski storage. Easy unload/load zone on arrival. Karen's instructions were perfect. Some important notes! The owner will require you to sign a lease agreement. This was easy and not a problem for me, but good to know ahead of time. She will also ask for your photo ID and the names of all people staying with you. In addition, the primary renter must be 30 years old. Note that the second bedroom only includes a bunk bed. The diagram on VRBO is a bit confusing showing two separate beds but be sure to read the description. Quaint condo with great location. Free shuttle pickup very short walk from doorstep. Short walk back from slopeside if shuttle is backed up. Also very close to groceries and restaurants.